Looking out to Sunrise Peak and Udo Island by Kim Hyo-jin along Route 2 during the guided walk on Sunday. We have ONE guided walk on the trail. Lee Seong-gwan will be leading 13 pre-registered participants along Route 18 including an international walker from England. Photos in a random order from our Route 2 (reverse start) walk yesterday. Kim Hyo-jin started with 12 walkers at 9:30 a.m. and finished at 3:00 p.m. with 12 walkers. Sunrise was at 7:16 a.m. and sunset will be at 6:21 p.m.
We have a high of 9°C with cloud due all day turning to rain later. It looks like the heaviest rain will fall overnight and into dawn tomorrow. However, we’re looking at a light air (1 m/s – rare!) so no wind. Clean Olle Begins by Lee Seong-gwan at the Roue 16 Start Point on Saturday. We have TWO guided walks on the trail. Jeong Yong-ho will be leading 22 pre-registered walkers on Route 17 (reverse start). 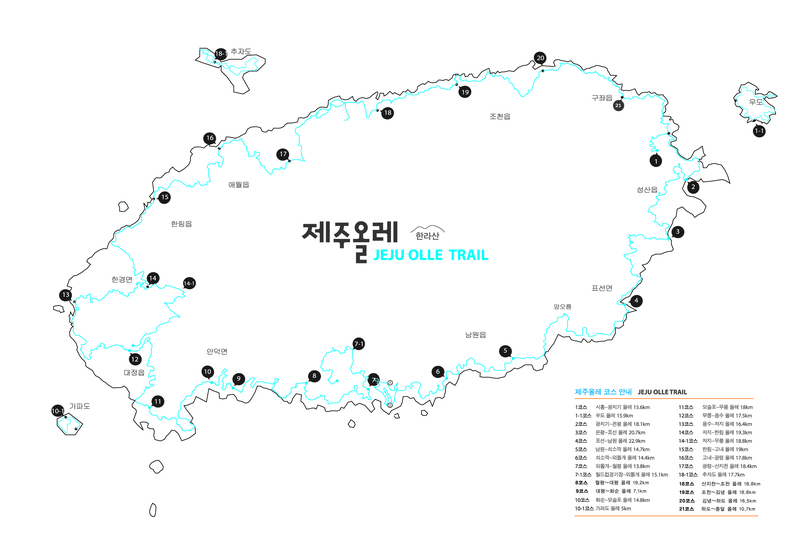 Then out on the eastern side of the island Kim Ho-jin will be leading 7 pre-registered walkers on Route 2. That will be a reverse start, too. Photos in a random order from the Clean Olle event on Route 16. A 9:30 a.m. start and 3 p.m. finish. 15.7 km covered. Sunrise was at 7:16 a.m. and sunset will be at 6:20 p.m. There are THREE walks on the trail. Husband and wife team Kim Tae-eun and Kim Jin will be leading 13 pre-registered walkers on Route 15-B. Then it’ll be a reverse start for 1 pre-registered walker on Route 18 with guide No Jong-yeol. Finally, Kim Yeong-ju will be with 3 pre-registered walkers for a Rotue 7-1 adventure. Kang Jin-cheol posted up some photos from his Route 14 guided walk. Some 28 walkers began in Jeoji at 9:30 a.m. with 25 finishing down in Hallim Port. Sunrise is at 7:18 a.m. and sunset is at 6:18 p.m.
We have a high of 8°C with cloud cover due most of the day and a few very light rain showers sprinkled into the mix. A light to gentle wind (2 – 4 m/s) is going to blow south-east.